Sowmya (A food-blogger running Nivedhanam) is going to celebrate 1st anniversary of her blog with a Hudson sponsored giveaway and a cookbook! 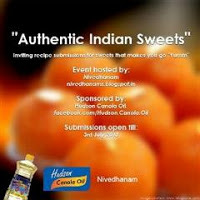 Do check out the details here for participating in "Authentic Indian Sweets" event. After verifying all the entries posted, 10 lucky winners will be selected!! !